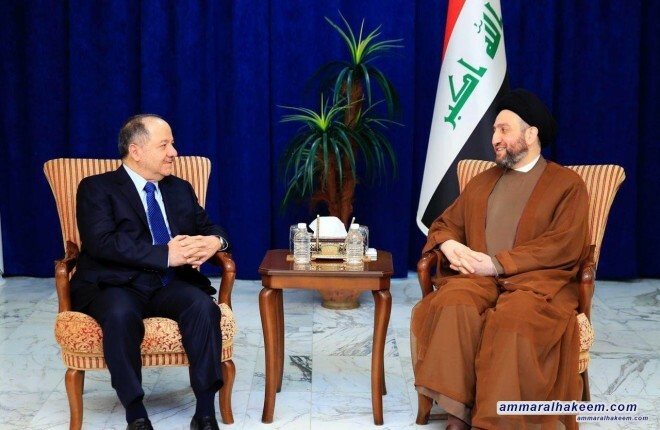 His eminence with Barzani discussed developments of the political situation in Iraq and the region. And considered Mr. Barzani's visit an opportunity to hold in-depth dialogues and discussions on the current circumstances, and to complete forming the government. His eminence discussed with Barzani the support and completion of the government, highlighted the importance of support in order to implement the government service and development program, pointed to the necessity of strengthening communication between political powers to provide appropriate climates to improve the service reality in the country. His eminence stressed the keenness of the Reform and Reconstruction Alliance to reach out to all the partners of the country, especially the Kurdistan Democratic Party, called to invest the new political climate to build confidence, unite visions and move forward in serving the people.